The illu­mi­nated slide shows a picture of a histor­ical map, the “Accu­rata Utopia Tabula”, with a complete legend of the nearly 2,000 ficti­tious place names, provinces, rivers, lakes and moun­tains. In addi­tion to the infor­ma­tion boards and maps that the passen­gers need, panels have been put up in the Unter den Linden S-Bahn station showing histor­ical views of Berlin, impor­tant events in the city’s history and time-honoured busi­nesses. In terms of urban devel­op­ment, Pariser Platz in front of the Bran­den­burg Gate is one of the most remark­able of all Berlin’s squares. It was laid out in 1734 and is today home to embassies, banks and insur­ance compa­nies as well as the Hotel Adlon, Tuchers Restau­rant, Star­bucks Coffee, Bugatti and KPM. 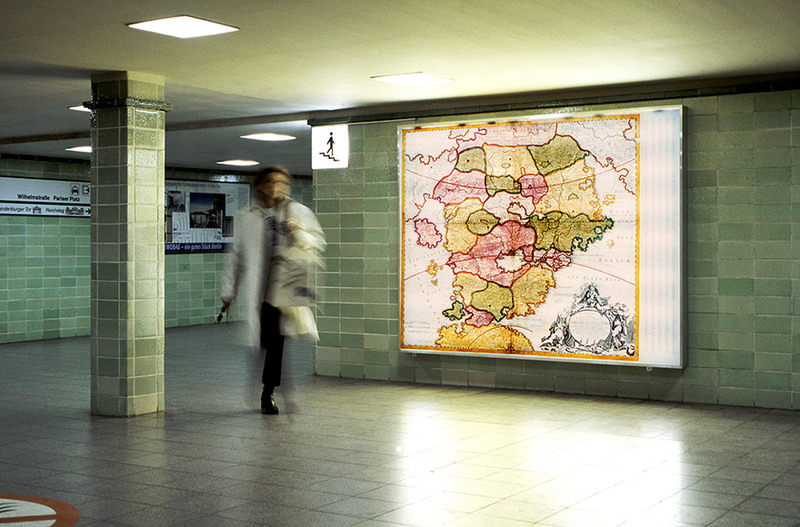 And right in the centre of this arrange­ment, in a light box, is the histor­ical map as a large-scale slide with a complete legend. The „Accu­rata Utopia Tabula” was created by the German cartog­ra­pher Johann Baptist Homann (1664–1724). 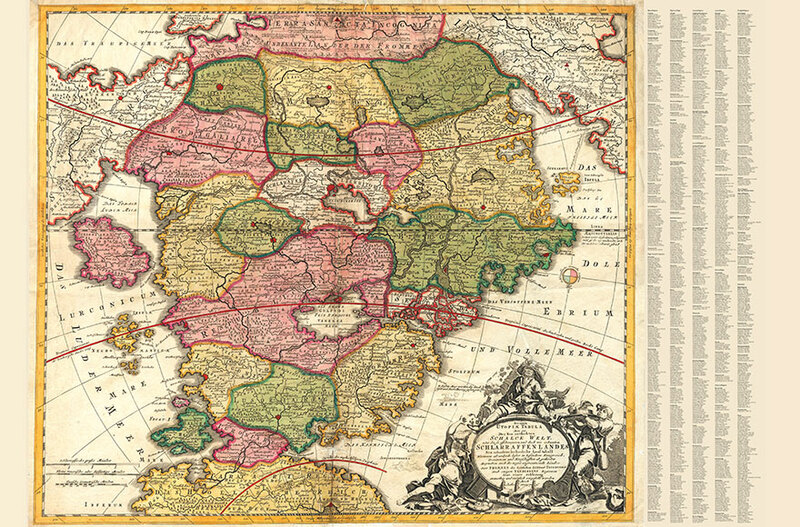 It puts the travel account “Erklärung der Wunder­seltzamen Land-Charten UTOPIÆ” (Expla­na­tion of the wonderful and strange map of UTOPIA) by the impe­rial general Andreas Schnebelin into a scien­tific context, since it maps out longed-for places and depicts with great accu­racy an area of the utopian world consisting of 17 provinces and several groups of islands. In his 1494 work, Sebas­tian Brants described the Land of Milk and Honey as a parody of paradise. It portrays the vision of a life of unlim­ited desire. The imag­i­nary place names tell of full­bel­lied pros­perity and bizarre abun­dance, but also bear witness to a life constantly threat­ened by penury. In the middle of the conti­nent is the land where gold coins can be found in the street, beau­tiful clothes grow on trees and noone needs to work because every­thing produces itself. This place in a topsy­turvy world is still impor­tant today as a foil to the daily life we all expe­ri­ence. Embedded as it is, in actual history Milch & Honig does not, however, at first glance, appear to be a work of art: after chancing upon the map and its subject, passers-by may subtly find out about the posi­tion of Pariser Platz as a place of great luxury and a reflec­tion of today’s ideals.